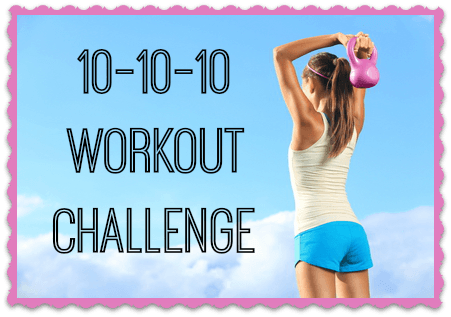 Try this 10 minute workout challenge! I’m always trying to mix up my strength training. I try to make it fun as I can, but I try to make sure it’s still challenging. To tell you the truth, I hate strength training! I would much rather do cardio, but as we all know strength training is super important, whether you are trying to lose weight or not. Strength training strengthens your bones and muscles, and helps prevent injuries. For this 10 minute workout challenge, we are doing 10 different exercises and 10 reps for each exercise. Then we see how many sets we can do in 10 minutes! The more you do this workout, the quicker you will get at completing the reps and the more sets you will be able to do. Remember, don’t push yourself too hard! You don’t want to get hurt! Start with a warm up. Now do ten each of the following moves, you can do them any order you like! I love this workout because it is so quick, you are done before you know it! I love that I don’t need any equipment to complete it! That’s another thing I hate about strength training – lugging around weights and other equipment. But now I don’t have to! You can even substitute these exercises with your favorites, or with exercises targeting certain areas. You could do a leg day, an arm day, a core day, or mix it up everyday! If you need some more motivation to workout check this out! Thanks for this reminder. My 14 yr old has been asking me to do a workout with her and I think this would be a great to start with.